IMF managing director Christine Lagarde will not attend an investment conference in Riyadh, as global concern over the disappearance of a Saudi journalist grows. 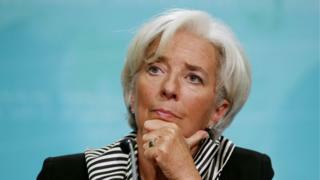 A spokesperson said Ms Lagarde’s planned trip to the Middle East “is being deferred”. She becomes the latest high-profile name to pull out of the event dubbed “Davos of the Desert”. The moves have come amid outcry over missing journalist Jamal Khashoggi. Mr Khashoggi, a critic of the government and a columnist for the Washington Post, vanished on 2 October after visiting the Saudi consulate in Istanbul. Authorities there believe he was killed in the building by Saudi agents, an accusation that the Saudi authorities have dismissed as “lies”. “The Managing Director’s previously scheduled trip to the Middle East region is being deferred,” an IMF spokesperson said in a statement, without providing further details. The decision marks a turnaround for Ms Lagarde, who had previously said she was “horrified” by reports coming out of Turkey but would still attend the Saudi conference. HSBC’s John Flint, Tidjane Thiam of Credit Suisse and JP Morgan’s Jamie Dimon are among others who have withdrawn from the event. An introduction to the conference on its official website says it “will immerse thousands of delegates from all over the world in a rich agenda”. A page with a list of confirmed speakers has been deleted from the website for the conference, which runs from 23 to 25 October.